The moment you land on Energy casino, you’ll notice the crackling spirit that it offers its customers. It almost makes sure that you go ahead and try your luck here! With some fabulous casino games from the house of leading software developers like Net Entertainment, Microgaming, Quickfire, Wazdan, and Green Tube, Energy casino keeps the spirits high and energised at all times! Some of the popular casino games offered by Energy are slots like Starburst, The Game of Thrones, The Invisible Man, Golden Seven, Jack and the Beanstalk, Mega Joker and Lord of the Ocean. Energy casino also has many progressive jackpots. Players whose luck shines in a particular game are mentioned on the site, along with their winnings, which is a big boost to those gamblers and inspiration to the new ones. Your name could be next! An innovative and interactive display is the USP of Energy casino as the design is very modern. 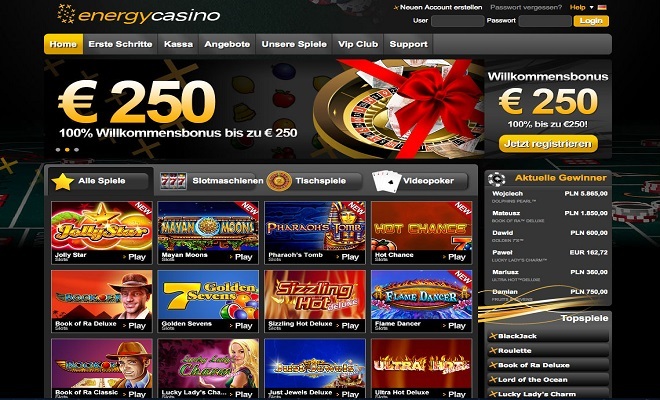 Promotions and offers at this online casino can give other websites a run for their money. Not only does Energy have regular bonuses for all new gamblers who register with them, but they also have an aggressive marketing strategy around holiday seasons and give extra perks to all gamblers during such special weeks. Energy casino offers a 100% bonus to all those who make their first deposit with the maximum limit of the bonus set at €200. Players can start off with a minimum deposit of €10. Energy casino also provides a reload bonus on the second deposit made by gamblers into their account. A 50% reload bonus up to €200 is an innovative way of getting customers to make a second deposit and gamble. Frequent players can get Energy Points, which can be redeemed at a later point. Energy’s main page has separate tabs for table games, poker, slots and jackpot games, but players also have the option of checking out the games provided by a particular software in the ‘Games’ section in the header. Energy casino takes pride in the fact that it provides its players a safe payment getaway through various options online. You’re given a whole lot of options like Visa, MasterCard, Neteller, Ukash, Skrill, Euteller, Trustly, Envoy, Paysafe Card and more. As per your convenience, you can choose the ones that you’re most comfortable with. Withdrawal and deposits are hassle-free here! The customer service representatives are quite efficient and helpful. Live chat enables you to interact with them the moment you face any issues. They are also available through email and phone to solve any problem as quickly as possible. So, choose the mode you want to connect with them and go ahead and solve any issues that you may have. Overall, Energy casino could be the energy drink that you love. It energises you instantly and gets you ready to face the action! Sign up today to take advantage of the various offers and promotions!